We return to Portland to see Renard still talking to Mesiner who is… dead [upward inflection]. 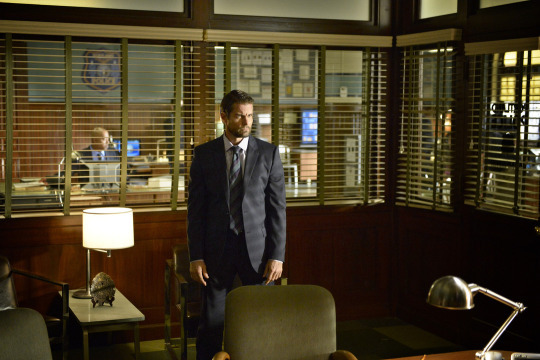 Right as Meisner is taunting Renard about all his morally corrupt choices, dude gets that call. You know the one: “So we killed a lot of people to get you elected and you just gonna hold a press conference and resign? That’s what we doing now?” So Black Claw is pissed at Renard and Renard isn’t exactly happy with them either. Meanwhile back at the spice shop, devilspawn has questions about why Nick looked like her dad. Everyone is appropriately creeped out by her and then Diana ups the ante by telling Rosalee that a) she has a baby in her and b) it’s more than one baby. Holy EPT! Kids say the darnest things (when they’re mostly likely made of pure evil). Across town, a man is at a computer cyberstalking a baby, looking at pictures, at maps, at generally things that give me bad feelings. At that baby’s house, his mom is obsessively taking pictures of her baby, Auggie while his dad passive-aggressively tells her that she’s going overboard with the lowkey documentary making. It’s the middle of the night when the couple is woken by the baby’s crying which was probably caused by the man standing over his crib. When the mom comes into to check on the kid, the man woges, knocks her out, takes off with the kid. After Diana and Kelly fall asleep, Nick and Adalind start to talk. About the same time, Eve starts to climb up the ladder from the tunnels to the loft, but she overhears Nick and Adalind being a little too lovely and she decides to stay in the cold and darkness. In his office, a sad not-Mayor Renard is reading about how he renounced the Mayorhood when Nick walks back into the station as a not-wanted, reinstated cop to the cheers of his co-workers. Renard is appropriated pissed. 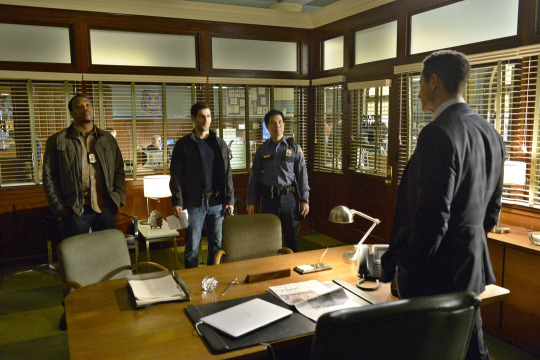 After calling Nick, Hank, and Wu into his office to rather pathetically reassert his authority, he starts talking to Meisner. Dead Meisner. In his office. With all the windows. At top volume. He’s working through some things. Nick, Hank, and Wu head off to investigate the babynapping. For once, the victims—at least the mother—are actually clear about the wesen part of the crime. The mom is like “A monser stole my baby.” Her husband could not be more annoyed by that. “Chill, baby, chill.” She’s like “Back up off me darling, I saw a three-armed three-eyed monster take my baby.” She draws a picture of the monster who is at that very moment across town holding her kid and having visions and headaches of some sort. The baby cries and the man who took him woges and I was really expecting this to get gruesome fast, but instead the woged wesen caresses the baby’s face and calms him down. Speaking of isolated monsters that no one understands, Eve is still in the tunnels (Why? Why?) and she’s been thinking about Nick’s stick. His magic stick. The one he and Monroe found in the black forest, you perverts. Nick and Hank realize just how much the baby’s mom has been posting online. Wu has found related monster-stole-my-baby cases. Nick knows they need to consult the books to see exactly what they’re dealing with, but when he stands up from his desk to leave, he’s lightheaded and doesn’t know why. It probably has something to do with Eve touching his stick. She took it out of its hiding place and held it in her hand. Then it burned her hand. Like it knocked that SWAT team out that was coming for him when he was hiding in Buddy’s shop. That stick only likes Nick so far. Eve puts it back in its box only to find that the burn on her hand has morphed into one of the shapes she saw during her ordeal with the death grip. Then she starts scrawling on the walls; this can’t be good. At the shop, Nick, Hank, Monroe, and Rosalee look through the books for what kind of Wesen they’re dealing with. Hanks finds it: el cuegle, a baby thief who keeps babys through the “hour of dread” until it’s time to “abort the bad future.” Okay. So, did I mention that Rosalee is pregnant and they’re talking about baby-stealing baby-eating Wesen? Meanwhile, the wesen is in a convenient store buying baby cough medicine when he starts having more visions. He collapses, woges, freaks out errybody in the store, and runs out. Of course, Wu, Nick, and Hank get the call. They get a plate from the surveillance cameras at the store. While they’re investigating, Rosalee is like “I love Nick and all but he’s a magnet for near-death experiences and I’m pregnant so… we might need to move to the suburbs.” She is not about that nursing on the frontline life. 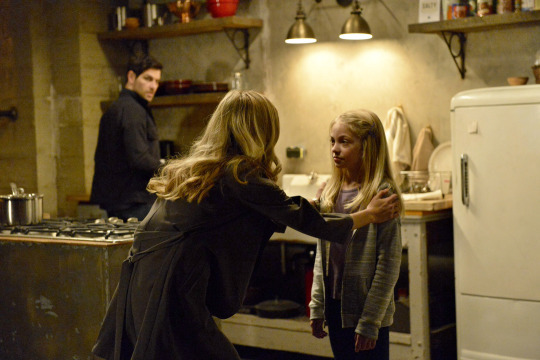 Right as they’re having that conversation, Adalind drops Diana off at Renard’s for a sleepover. Creeper starts boiling water with her mind and asking Renard why he doesn’t love her mom. Renard asks Diana about Bonaparte and she’s on some “You killed him before he hurt my mother.” Oh. Welp. Then Renard starts planting seeds. “If you ever see Nick hurt mommy…” Of course Diana says that Nick would be sorry if he did that. Something in Renard’s evil smile makes me think we might see that body double spell again because the series finale. At the station, Hank is realizing how convoluted the El Cuegle/convenience store incident was and it’s complicating the idea that he and Nick have about him. He was buying cough medicine for a baby he was going to kill and eat anyway? He collapsed because he had a migraine? Did he woge on purpose? Wu tracks down El Cuegle’s identity through the plates they pulled from the security footage. Then they find the car and storm the apartment. They arrest El Cuegle and return the unharmed baby to its parents. In the interrogation room, El Cuegle tries to explain that he stops evil, that Grimm are too Jon Snow. They see the past with one eye, the present with the other, and the future with the third. El Cuegle’s third eye lets him see children who will be horrible. Turns out the adorable baby he kidnapped is going to kill his parents on his 19th birthday. Hank is not trying to hear it. Then, El Cuegle drops a name and tells them to look up the one baby he couldn’t bring himself to eat (he kidnapped and returned the kid unharmed 18 years ago). That kid killed 10 people. He asks Nick “If you could stop Ted Bundy…?” Meanwhile, I’m having visions of a Trump-less world. But, Nick and Hank aren’t trying to hear it. But it doesn’t matter because El Cuegle escapes. I think you know where he goes… back to eat that baby. 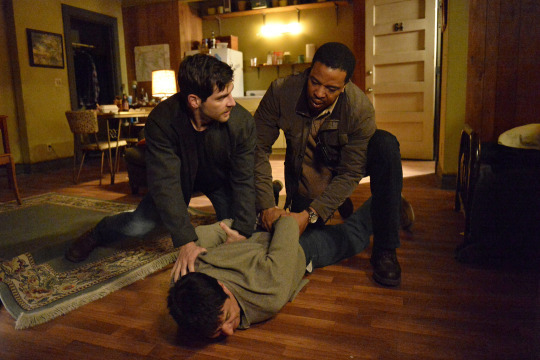 But Nick and Hank stop him dead. And now I guess they wait 18 years to see if he was telling the truth. I have so many questions: What is going on with Mesiner and Renard? Is Diana going to go full evil and kill Nick? Where is Trubel? What is Eve writing on that wall?